01.16: Mac Plus introduced at $2,599, first Mac with SCSI. 01.16: Macintosh System 3.0 introduces disk cache and HFS, which allows nested folders. 01.16: LaserWriter Plus introduced at $6,798. Feb.: Macintosh System 3.1 is buggy. 04.14: Mac 512Ke introduced at $1,999. June: Macintosh System 3.2 fixes bugs in 3.1. Sept.: Apple IIGS introduced at $999, fastest Apple II at 2.8 MHz, introduced Mac-like GUI. Japanese and Arabic versions of Mac OS introduced. SCSI standard accepted by ANSI. Compaq ships first 80386-based PC. Jan.: Macintosh System 3.3 prepares Mac OS for networking and AppleShare. 03.02: Mac SE introduced at $2,898 with two 800 KB floppy drives. 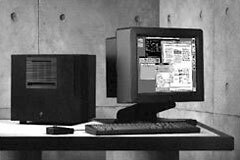 03.02: Mac II, first 68020-based Mac , introduced at $3,898 (1 MB RAM, 800 KB floppy) and $5,498 (w/40 MB internal hard drive). 03.02: Macintosh System 4.0 has improved Chooser and Control Panel. AppleShare file server software introduced. April: Macintosh System 4.1 supports Mac II, requires 1 MB RAM to function. April: Apple creates an "independent" software company known as Claris. Oct.: Macintosh System 4.2, a.k.a. System Software 5.0, introduces background printing, DA Handler, and MultiFinder. Nov.: Macintosh System Software 5.1 updates HD SC setup and LaserWriter drivers. IBM and Microsoft release OS/2. August 11. Microsoft ships Windows 1.01. First fax boards for PCs. Sun introduces first RISC CPU. Jan.: LaserWriter II series introduced. Feb.: Apple ships A/UX (Apple Unix) for Mac II. March: Apple introduces CD-ROM player. 08.01: Mac SE with FDHD/SuperDrive 1.4M floppy drive introduced. 09.16: Apple IIc+ introduced at $1,099. 09.19: Mac IIx, first 68030-based Mac, introduced in September at $7,769. January. Microsoft ships Windows 2.03. • Morris Internet Worm infects 6,000 computers on Internet. October. First NeXT released, the NeXT Cube. 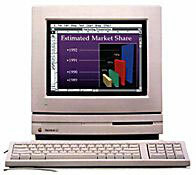 01.19: Mac SE/30 introduced at $4,369, first 68030-based all-in-one Mac. 03.07: Mac IIcx introduced at $5,369. March: Two-page and portrait b&w monitors and video cards introduced in March. 09.20: Mac IIci, first 32-bit clean Mac, introduced. 09.20: Mac Portable (9/89-10/91), first portable Mac, introduced. September 18. NeXT introduces NeXTstep OS. Michael Spindler becomes Chief Operating Officer in January, President in November. March: Apple extends warranty for US hardware to one year. 03.19: 'Wicked Fast' 40 MHz Mac IIfx introduced. 10.15: Mac Classic introduced, last 8 MHz Mac. 10.15: Macintosh LC introduced, first low-cost color Mac. May. Microsoft ships Windows 3.0. First PCs with 80486 CPU ship.